After a slow start due to a cool and extended spring, Alaska’s wildfire season has begun in earnest as a result of warmer temperatures that has produced thousands of lightning strikes across the state the past two days. A total of 47 new fires were reported around the state on Monday and Tuesday, according to the Alaska Interagency Coordination Center in Fairbanks. The majority of the new fires were caused by lightning in remote parts of northwest and southwest Alaska. Nineteen new fires were reported around the state on Monday and 28 new fires were reported on Tuesday. This map from the Alaska Interagency Coordination Center in Fairbanks shows lightning activity in Alaska and the Yukon from Sunday to Wednesday at noon. Fire managers for both the Alaska Division of Forestry and BLM Alaska Fire Service are currently assessing the new fire activity and strategically prioritizing fires and resources, while at the same time searching for additional new fires that may be lingering on the landscape as a result of lightning. As of Wednesday morning, there were 57 active fires in Alaska and eight of them were being staffed with about 200 firefighting personnel. 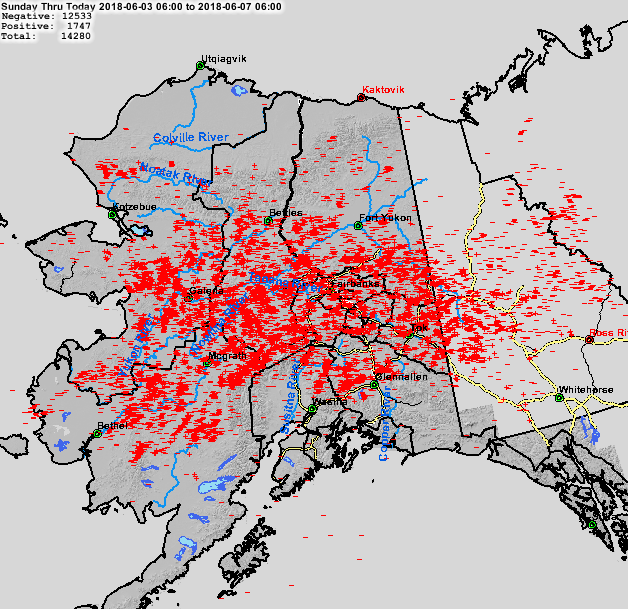 More than 12,000 lightning strikes have been recorded across Alaska in the past three days, including approximately 7,500 strikes on Tuesday, by far the largest number of strikes recorded this season. More lightning is predicted over the next two days as a high pressure ridge sitting over the northern half of the state produces the warmest temperatures of the season thus far in Alaska. Temperatures climbed into the mid-70s throughout much of the Interior on Monday and Tuesday, with a few reports of temperatures as high as 80 degrees in the Yukon Flats. The warmer weather is quickly drying fuels, which have been receptive to lightning strikes. As of Wednesday morning, a total of 146 wildfires reported to the Alaska Interagency Coordination Center for the season and they have burned an estimated 12,279 acres. The increase in fire activity is a sign that the wildfire danger in Alaska is increasing. The Alaska Interagency Coordination Center in Fairbanks reported on Monday that Alaska moved to Preparedness Level 2 on a scale of 1 to 5 with 5 being the highest. In addition, make sure campfires are completely out before leaving a campsite by drowning fires with water and stirring repeatedly until they are cold to the touch. Clear down to mineral soil around campfires and dig a pit or rock ring to keep the fire confined.